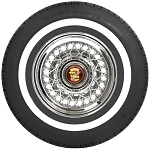 * Note on photos shown: Tire and whitewall sizes are approximate and are offered as an example of how the tire generally appears. Recommended Rim Widths: 5 - 6.5"
▪ Asymmetrical tread design provides optimum traction and handling performance. ▪ All season tread design. ▪ Outstanding ride and long tread-life. 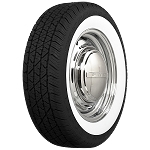 ▪ Whitewalls are molded into the tire during construction, not added on later. 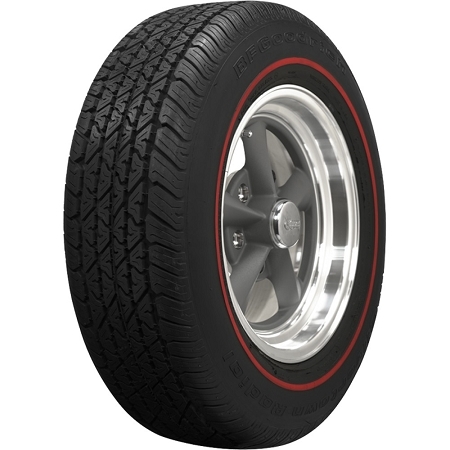 BFGoodrich Silvertown radial tires are designed for pre-1976 vehicles and have modern aspect ratios, so interchangeability is not implied nor always possible because of rim widths, wheel well clearance and speed and load ratings required. It is very important to maintain proper inflation pressure (35 psi MINIMUM) on BFG Silvertown radial tires. Vehicles designed for bias ply tires may drive considerably different with radial ply tires. Please use extreme caution. 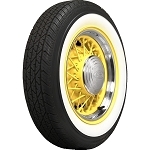 Older rims that were originally designed for bias-ply tires may crack if used with modern radial tires. Please use caution by inspecting your rims on a regular basis. Never mix bias and radial tires on the same vehicle. Your vehicle may over or under-steer, causing you to lose control of your vehicle. If you run inner-tubes with your tires, it is imperative that you carefully inspect and remove all stickers on the inside of the tires. We have found as many as six inspection stickers. They are not always easy to remove. We have used a hair dryer to loosen them up. If you do not remove these stickers, they can puncture your inner-tubes and cause a flat tire which could be a safety-hazard. Please call us if you have any questions on this important issue. All sizes are both DOT and ECE marked. ECE is the certification for the European market. UTQG: Treadwear: 540. Traction B, represents the tire's ability to stop on wet pavement. Temperature: B, represents the tire's resistance to the generation of heat and its ability to dissipate heat. Approximate mileage: 45,000. Note: this is an estimate, not a warranty. Recommended PSI: 35 PSI. Low air pressure can cause the sidewall to crack or lead to tire failure. Mounting/Balancing Recommendations: Static balance with the weights on the inside of the tire only in order to protect the soft whitewall. This also gives a more pleasing appearance. We recommend the use of lug centric balancing over hub centric. Due to the cosmetic whitewall insert these tires may take 3 to 5 ounces to balance, this is normal. S speed rated (112 MPH Sustained Speed). 70 series features the "V" bloc tread design and are "S" speed rated. 112 mile per hour sustained speed. 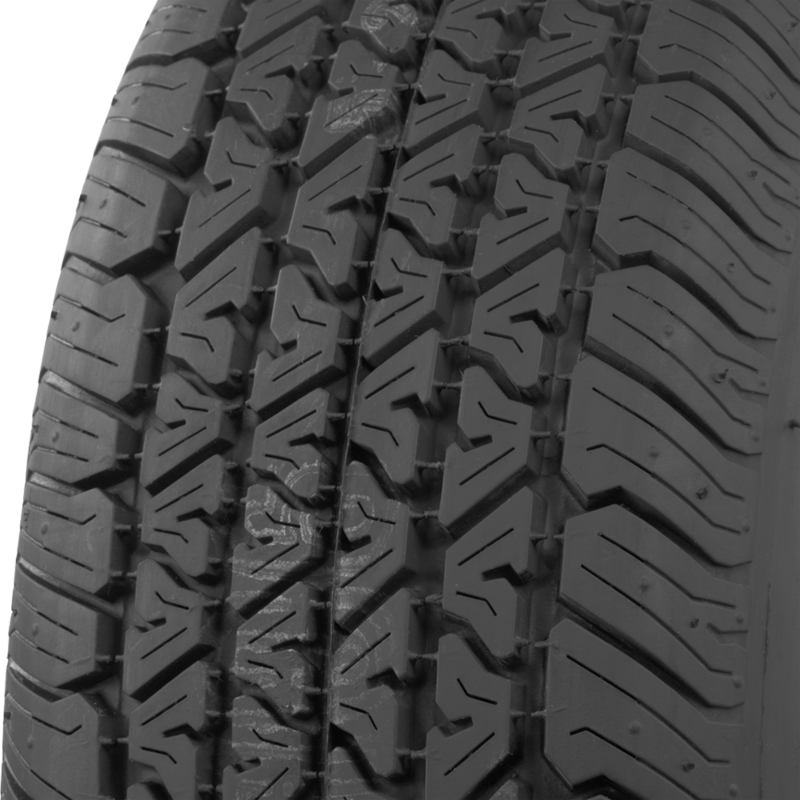 75 series feature an all season tread design. Made in the USA. 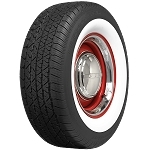 The whitewalls, redlines and redlines are molded into the tire, not added on after the tires are made. Caution: When converting a bias to a radial, the 75 series will be closer to the 78 or 83 series bias size. The 70 series may rub in in some applications, especially with fender skirts. 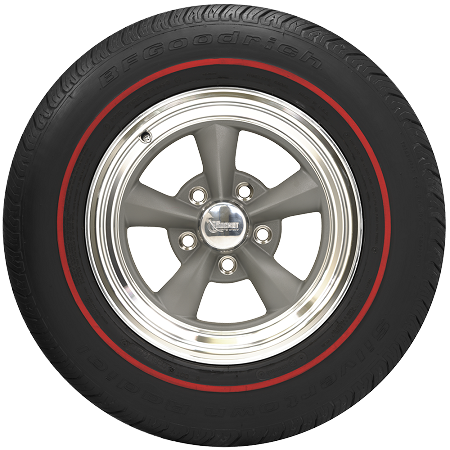 Older rims designed for bias-ply tires may crack if used with modern radials, as the radial places more stress on the wheel. Please do not hesitate to call or email us with any questions. We are always a phone call away. Thank you!